Thank goodness November is upon us. The winterizing, repairs and renovations are almost done or at least it'll soon be too late if they're not, and that means more Toy Soldier time is coming. Feels like ages since I added any new figures or equipment, of course some desk time has also been spent touching up old 54mm figures ready for sale or disposal in some form. I had to call the last game before it was officially done as I needed to use my table as a painting surfaces for bits of trim shelves etc for renovations in the none toy soldier world. To be honest though, it was already over really, all the reserves had been committed, no one had been helplessly over run, it was just a question of grinding till one side had finally had enough. That bothered me a bit. Don't get me wrong, faced with an opponent I tend to be one of the "rally 2 men and a dog for a last stand" type (See Barker's Purple Primer aka Airfix Guide to Ancient Wargaming) but left to myself, well, it helps if there's some sort of limit. One you can actually reach. Its even better if its something you don't have to track continuously since I often forget to do so. The only mechanism at present is a default one in the absence of scenario specific conditions, 50% unit loss, way too high but is 30% or 25% really better when there are 24 units per side? Of course part of the problem is that I've made it damned hard to destroy units because I don't like seeing them blown away by a few stray dice so a prudent general will pull back damaged units to save them from being destroyed. Ah. I think I detect an internal conflict of interest. So I revisited all the rejected morale rules, end of game rules, drastic kill quick rules and so on and then looked at the 1/2 empty table and thought about this being the equivalent of an average to large Grant Teaser and about 1/2 what the table could hold and about the small games I want to play. Then I stopped everything. Sometimes the problem is just the scenario or timing. In this case I didn't have time to focus on the game but had been sneaking in turns once or twice a day for a week and had not set hard and fast victory conditions. Would a 50%+1 victory suffice for the either or both sides? For the defender? Probably since they could dig in and hold if even a few reinforcements arrived. For the attacker? .No, unless they have big reserves close at hand to exploit. Do they? I don't know, I didn't get that far. It was an impromptu affair to see how things ran. I was bothered by the small amount of the table used though. I had played with longer moves or with larger but fewer squares which made each move feel longer and I can see that with things as they are, I would probably end up always fighting in a corner. I had already noted in August that going to company units would effectively mean a scale change but I was dragging my feet so as to fit the big guns on table for that Divisional game I'm not going to play. Time to bump up movement and ranges and play a smaller scenario again, one with clear victory conditions other than casualties. Sunday is supposed to be cold and rainy, maybe even a flurry. I think I've earned a day off. I've been too busy with renovations and other domestic affairs for any painting or casting but there was still time to ponder and posit. Despite the success of last week's game, I decided that I still wasn't happy on the question of command control and organization, neither from a game nor a historical perspective. The organizations did not match any historical ones and the game lacked the extra player-challenge I look for in a solo game. To keep this short and avoid chewing my cabbage twice (as they say) suffice it to say that I decided to confirm the system whereby a Colonel plus 4 companies, each of 4 figures, forms a battalion as proposed in August in the Charge! Option post. I had resisted for fear of forcing myself to build and play a double sized, Division level Western Front game with a table crammed with soldiers from edge to edge. It sounds like a tedious bloodbath but I'll cross that bridge if I ever come to it. Might work as a club or convention game someday but in the meantime, this level should work better for those Sideshow Campaigns and quite well for the more open warfare of the early months. 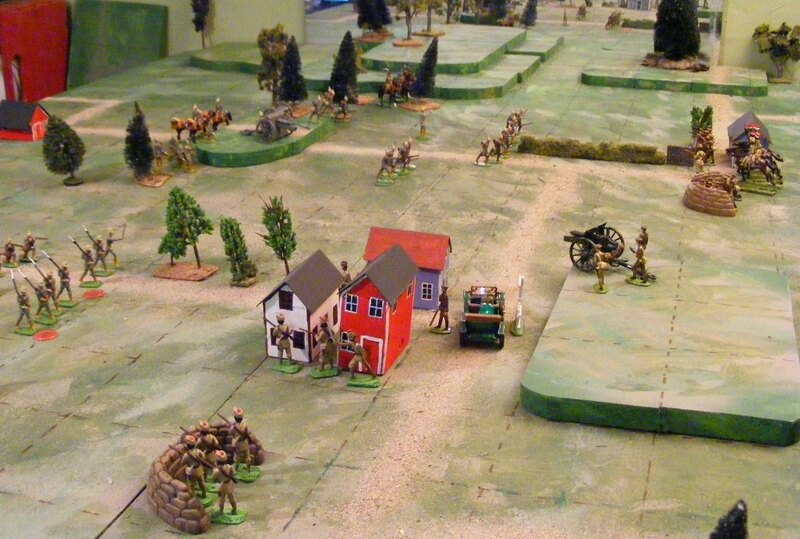 Early in the test game, 3 Oberhilse battalions, 1 extended as it advances on the town using fire and movement, the closer one advancing in company columns and and on the hill in the background a massed battalion moving up to support the guns and threaten the enemy's reinforcement. A 4th battalion has barely marched on in a long road column and is just off screen. Coincidentally, this will give me 2 to 6 sub commanders with as many or more independent batteries, squadrons and so on or a very manageable number of "direct reports" for the Square Brigadier with some minor jigging. Having merged the old SB and new proposed rules a replay of the scenario is in progress, a turn here, 2 turns there, and going even better with more tension and decision making to increase engagement. It also has a better German attack plan using more fire support but that's another matter. Slightly later in the game. The town is now disputed but the Queen's soldiers are flooding on to the table. The current draft is available above as the Tin Brigadier. They still need various odd ball rules drafted in for boats, ambushes and so on as well as pages of explanations and examples. Quiet reigns over the wargames table now but last night it was a different story. My Irregular Miniatures Mitrailleuse finally gets painted and committed to battle, briefly. Earlier this week the armies of the fictional states of Atlantica put the newest rules draft through its paces. My long term intent is to have the possibility of historical Great War games as a bonus option, but to focus on my fictional setting of Atlantica in the early 20th Century with a mix of drab and colourful uniforms. So, that is where I set the game. Having tried some small games recently I decide to try the largest game I could without drafting in too many musket armed soldiers. I intended to go in to some details on rules, organization and future plans but this post has stalled long enough so I'll cover all that over the next week and just briefly present the battle. The initial force was a Rebel Brigade with 4 companies of infantry and an MG (An Irregular mitrailleuse actually which I bought, hmm 10 years ago maybe? and painted up for the occasion). Two companies garrisoned the small town on the road up which reinforcements were expected while the rest held the main town and vital cross road. 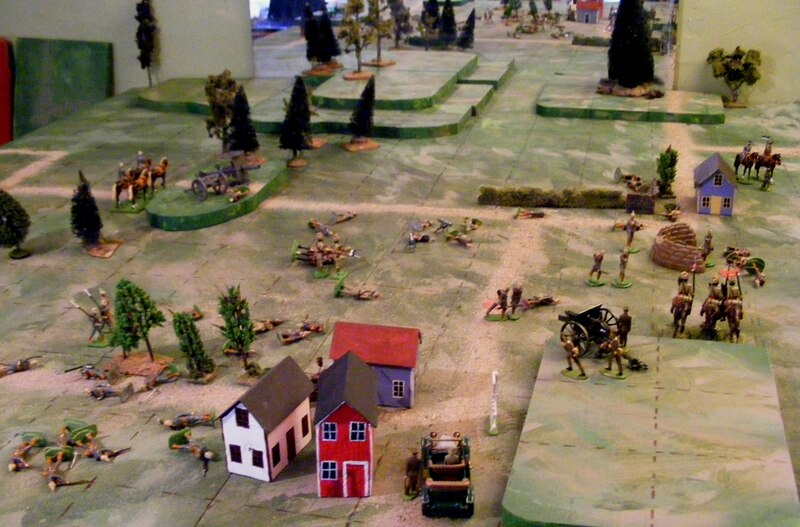 Coming to their defence, once the dice allowed it, were, a Brigade of cavalry with horse artillery attached, a Brigade in Khaki with 4 companies, an MG and a light gun, and a Brigade in Red with 6 companies and a battery. Oberhilse marched on with a mixed Brigade with 2 cavalry and 2 infantry and 2 Brigades each with 8 infantry, an MG and a battery. There was supposed to be a heavy artillery battery but it never showed. (ie didn't get finished in time). The Khaki Brigade blocks the advance of the Blues with their bodies while the Red Brigade rushes to the rescue. The initial Oberhilse plan was to storm the main objective with the Grey Brigade while the cavalry rode around it on the right and cut the road and the Blue Brigade struck up the middle threatening the secondary objective without attacking it but cutting the road and flanking the main objective. The main attack went in perhaps too hastily with no fire support and got a bloody nose. Taking out the new mitrailleuse was almost the only success to show for losing over 1/3rd of the brigade. As the artillery came up and the Blue Brigade moved in on the flank, the Rebels rolled low enough to bring on the Faraway Cavalry. They galloped up, deployed the gun and 2 dismounted squadrons to hold the attack up the middle while 2 more squadrons galloped on to hold back the Oberhilse cavalry. The Oberhilse infantry had lagged so it was 2 vs 2 with no really good reason for Faraway to risk a fight when the enemy posed no immediate threat. But Faraway's cavalry generally doesn't need a good reason and the dice backed them up. The dice continued to favour and Khaki clad infantry columns were now racing onto the table and up the road to replace the dismounted squadrons who shifted over. The flank was cleared! The crisis of the battle. Despite heavy casualties the Hougal Rebel Zouaves are still holding out but Oberhilse is reorganizing for a second, better supported, assault. 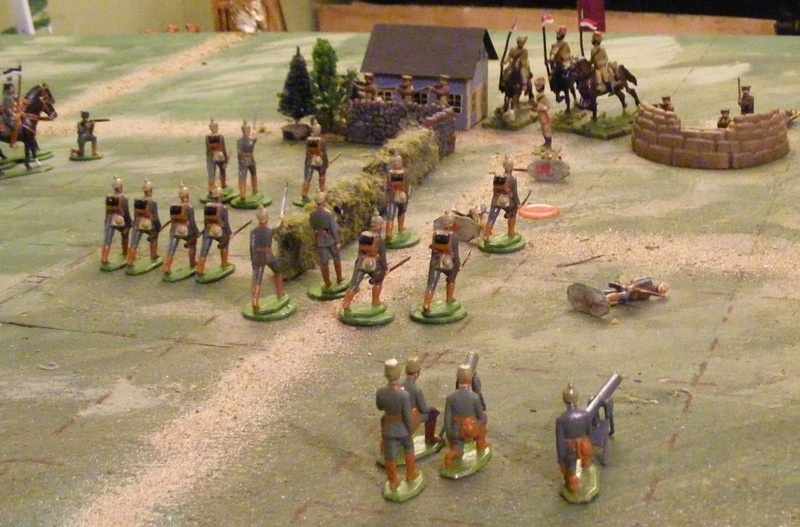 Faraway's cavalry brigade has driven back the Oberhilse advance guard but has not yet routed them and has suffered heavily in making their counter attack. The Khaki Brigade has arrived and stopped a Blue attempt to cut the allies in half but has been nearly wiped out in the process. Will the Red Brigade be enough to hold Oberhilse's final assault? Having reorganized and brought up artillery and machine guns, Oberhilse attacked again. Once again the rebels held but this time the defenders also took heavy casualties as did the Faraway infantry holding the road. Only the arrival of the Red Brigade stabilized the situation. A hard slog now began with heavy losses on both side. Eventually Oberhilse managed to shift 1/2 the Blue Brigade over and pushed half way through the town but that was it. Their reserves were shot and there were not enough men for another push. Their only hope was to break the enemy's will in a battle of attrition. Faraway also lacked the manpower to take back the town but lost more trying anyway. 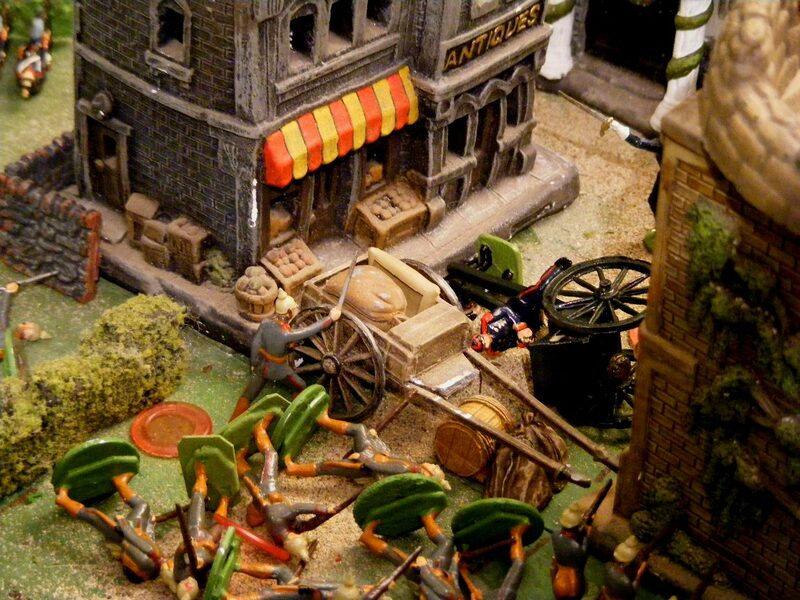 At this point the slight advantage in artillery began to be felt. The Faraway General also noted that his cavalry was in much better shape and he pushed forward a dismounted attack on their opposite number, backed by a mounted reserve. The victory wasn't cheap but it was the Oberhilse cavalry brigade which gave way opening up the flank. Shattered companies were brought into line but they crumbled and the Oberhilse commander was forced to retreat under the cover of his guns. Yes, yes it was. Barely. Oberhilse overran half the town but at a terrible cost and the fire of 3 Faraway batteries decimated the reserves and supports forcing the attack to be called off. Bottom line, a good game! A real squeeker with turns of fortune. Just the sort of thing I have aiming for in look and feel. I took the opportunity to test various rule options as I played but ended up coming back, with added confidence, to something close to what my initial choices had been. The current draft is available as a page above under Tin Army but be warned, it is a rough outline of a work in progress, with no explanations and lots missing. Experimentation is over though and this is the frame work that4 the full rules will be built upon. More on that another day. Now, I need to get going on cobbling together limbers and guns, terrain to make and , well, lots to do! I was preparing a normal post today but am holding it while I salute 2 Canadian soldiers killed this week in non-combat situations by homegrown terrorists. My condolances go out to the friends and families of these soldiers and my gratitude and respect go to all our soldiers and policemen who have answered the call and are putting their lives on the line. Warrant Officer Patrice Vincent a 28 year veteran in the regular forces was run down in a mall parking lot in St Jean Quebec. Cpl. 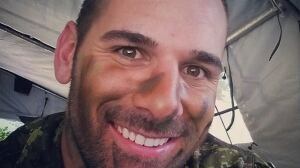 Nathan Cirillo, a reservist with the Argyle and Sutherland Highlanders of Canada was on guard at the National War Memorial when he was gunned down at point blank range. That is normally considered to be a post of honour, not one of danger. Both attacks occurred in places I am familiar with which adds an air of surrealism as does the video footage of a gun battle in the halls of the House of Commons but they serve notice that this time, this is not some news thing happening far away. This time, we are at war. Its interesting how a fairly minor issue can begin to feel like a desperate situation if it stalls progress and threatens what's already done. The more I struggled to reconcile half a dozen command control options with historical organizations, varying sizes of battle, my understanding of what they represent in terms of process, friction and history and what bits of solo gaming I like most and least, the more frustrating it all got. Switching gears I pondered various older school approaches especially Featherstone, Charge! and Big Wars and also reread a number of my own related posts. The result was a surprise to myself. A full division of Oberhilse troops encounters the vanguard of a mixed body of Hougal rebels and their Faraway allies. The first thing I tackled was unit structure. The original plan was for a 4 man battalion as a unit but having decided I needed an option for companies as units I made the 4 man units into nominal companies and proposed following historical organizations. This then quadrupled the number of proposed units and added a 3rd and potentially 4th layer of command which in turn broke the command system. To be fair it was already ailing a bit in larger and smaller games. 1. The 4 man unit works and I wish to keep it. 2. I don't get alot of enjoyment from trying to manage 3 or 4 levels of command but neither do I wish to ignore all structure. 3. An obstacle or two or a bit of friction adds interest to a game but too much becomes a burden and hindrance whether through monotony or frustration. The exact form of this uncertainty is not important to me as long it does not dominate a player's decisions which should be focussed more on defeating the enemy. 4. While I prefer to duplicate historical organizations, long term, esp. in a fictional setting, I would rather have a consistent organization and scale even if its wrong. In this respect I follow Lawford and Young who explained that while their regiments had 3 companies instead of the historical 8 or 10, that 3 could do the same evolutions so they saw no point in having more. 1). Wargame units are 4 man "companies". 4 to 8 companies plus support and a Commander form a Brigade. Intermediate levels may exist but are not shown while my companies represent around two real ones. Units not within 3 areas of their commander must score 4,5,6 to move. The Commander is assumed to have orders from the General and to be in communication to report and get order changes without this being shown. 2) The general's role is focussed on the higher plan and on trying to maintain the initiative assisted possibly by staff, observation balloon etc. This translates into a return of the initiative roll at the start of each turn. Winner choosing to go first or second for thst turn. 3)The return of initiative means I need to ensure that in the age of rifles, the defender can shoot at an attacker so I have also reverted to an older sequence: A moves, B shoots, resolve charges, B moves A shoots, resolve charges. Old fashioned but simple. So far so good. Has Someone Blundered? Revisiting Command Control. I seem to have hit a snag that will have to be cleared before my early 20thC gaming moves on, and an old snag at that: Command Control Wargame Mechanics. 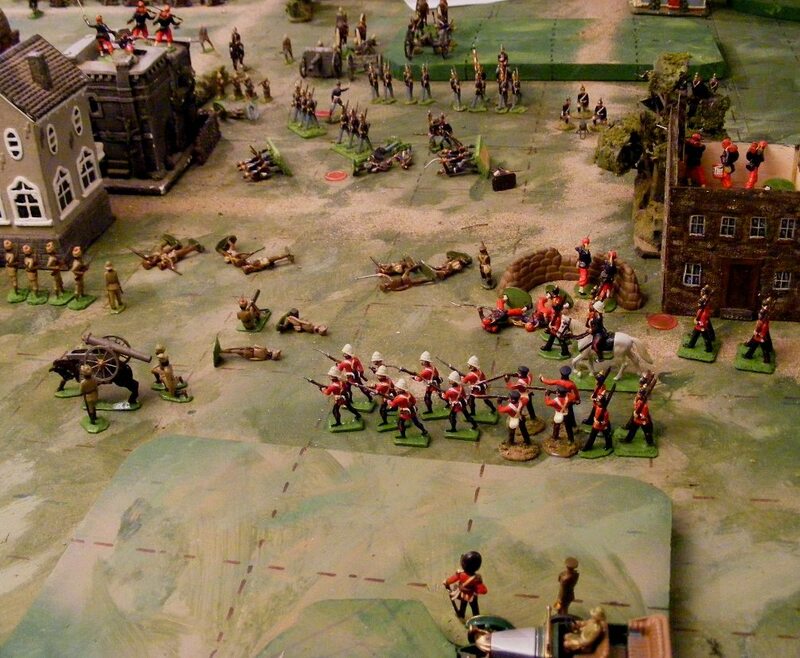 Plenty of ink and pixels have been dedicated to this topic by wargamers over the years, including by myself in this blog and elsewhere. In case anyone has managed to avoid the topic, the trite version is that real command systems are designed to get troops to do what you want while game versions are designed to do the opposite. Rather than launch into a 5,000 word essay on the historical case for and against various sorts of command control roles, let me just say that modern games that present a player with difficulties can be fun or frustrating or both all at once. Of all the various systems I've played, the oldest, that of simultaneous moves to written turn orders is still probably the best at capturing Generalship, especially if there is limited time for order writing as under pressures many players will misjudge their opponents intentions, forget minor but important rules, estimate distances incorrectly or just plain forget units. Enemy actions and combat results are then what add friction and prevent a player's tidy plans from coming to fruition. I've never been able to properly capture this in solo play though. The current Orders (or PIP) dice system I use (inspired by DBA) where you roll a die to indicate how many groups of units you can move has a nice "boardgame" feel to it and it has worked well with the Square Brigadier where each unit was a battalion. Now that I am using companies as units, grouped in battalions based on historical OB's, no matter how I tweak it, I am having trouble getting it to work seamlessly with scenarios that might range from 6 individual companies up to 8 or more battalions of 4 companies each plus a number of supporting units. I could probably solve it by ignoring historical organizations or having various systems depending on the size of the game but its not really doing a good job of "feeling right" at the company level anyway. So, for my next game, I am going to experiment with an older method, allowing the player as General to give orders to his direct reports at the start of a game, be they a battalion commander with 4 companies or a battery commander with 1 gun etc. Orders will last until changed or no longer relevant.. When orders are issued there will be a roll to see if they were received and understood, delayed, or lost with penalties for being engaged or too far away without communications etc. Normally orders to a battalion commander will apply to all of his units but if an individual company is "out of command" then it will have to dice each turn to move. In all other cases, dice and combat reaction rules will indicate determine how well units are doing in carrying out orders. So if a battery misses, perhaps they off target or perhaps the battery commander decided not to fire or there was a problem in the battery site. Obviously in a solo game both sides will know the others orders but it will usually be fairly plain for example, if an enemy battalion is dug in around a village then they are probably planning to hold it at least initially. To test the upper limits a bit and add a dash of colour, I think I will head back to Atlantica and break out some red and blue coats. I should jot down some actual rules to back up the concept while I am at it, especially since I've realized that I need to tweak the unstated ground scale to accommodate the .4 man companies. The goal is to play either on Sunday or the next cold rainy day. Happy Thanksgiving to all my fellow Canadians and Thank you to all those who stop by to have a look now and again and especially those who take the time to leave a comment. There are several things I thought about posting about this week but what little time and energy I have had for hobby stuff has gone into a few more troops and trying to get a mini draft of the rules that I agree with. For some reason when I get to typing, things creep in and change without authorization. What I really need is another game but my table is being used as a sorting station for a bunch of old 54's that need to go live somewhere else. The figures were just 8 more Germans to fill out the 2nd battalion and a couple of sepoys to expand the Maxim detachment into a reinforced rifle company that will get a fire bonus when stationary. Not as powerful as a full MG company but more flexible. 3 more Sepoys and I'll have a full battalion including British Colonel. The first solo game of my 1914 Centenary has been fought. Not much of a battle as battles go but a vital skirmish that was well worth fighting. The game was a fictional encounter set in the Race for the Sea phase of the war in October'14. It was designed largely around what was painted and ready to go. The rules were the latest enhanced Square Brigadier. For those surprised that I have not already published new drafts while I work on them, I am taking this seriously enough to abandon my usual generic DIY approach and do something that I haven't done for a while, sitting down and writing a longer set of rules that describes how I am actually using the rules specifically for my own armies and games. They will still be easy to adapt and I'll probably throw in some suggestions in an annex but the focus will be less on adaptability and more on to giving myself a firm basis for what I am doing. It could take a while but I will be posting some discussion of the rules and my choices and should have an interim update of the existing format up on the weekend. The Germans, having a numerical advantage, were given the role of attacking with 2 battalions of infantry (each of 4 companies plus Commander although one was of mixed Jaeger and Infantry due to the 2nd battalion not being finished) supported by the regimental MG company with 2 machine guns, a battery of field artillery and 2 squadrons of cavalry and an overall HQ. The Anglo-Indians of the independent Balimont Brigade consisted of 4 companies, an MG, field gun and 1 cavalry squadron with a combined HQ and Battalion commander. All infantry was entrenched. The larger town was the main objective controlling the line of communications to the main British army while the smaller village is a crossroad leading to expected French reinforcements. 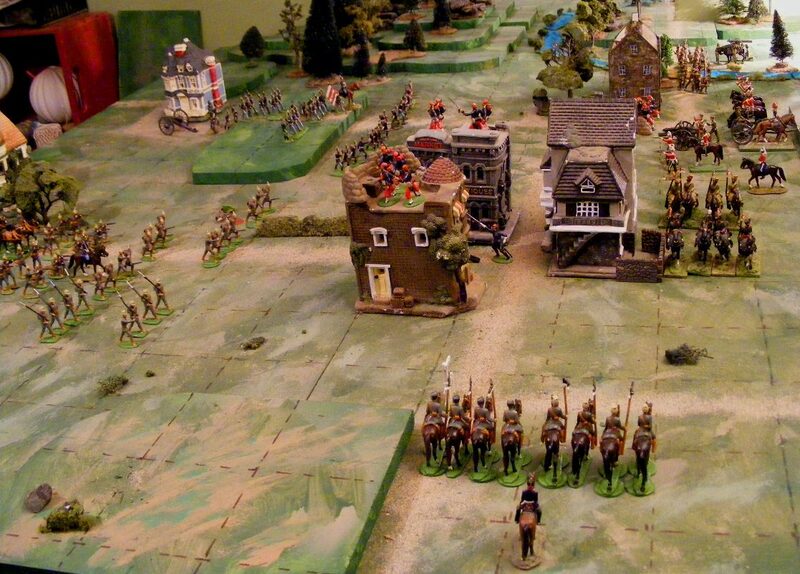 (Zouaves to be brought on at GM's whim bringing a change in the nebulous victory conditions). I decided to stick with generic units to start so no superior firepower for the Brits and no penalty for carbine armed German cavalry. The table is laid out in 4" squares with 3 of them representing roughly 1,000 yards giving a battlefield of roughly 6 km by 5 km. This is a bit much for a single battalion although some British battalions at Mons were tasked with defending a similar stretch of canal against larger attacks. A full brigade would have been more comfortable but things were pretty scattered and mixed up during those early months. Lastly, I played the British while letting dice choose from several initial German battle plans then bodging it from there as the battle progressed with attempts at impartiality. A reprise of yesterday's picture giving an overview of the table. The town at the crossroads is the key position with the road leading off towards the camera being the connection to the main British army. The objective is being held by a machine gun and 2 companies of MacDuff's Rifles supported by B Battery of the Royal Artillery. I actually played the game twice. The first time I made several fatal errors. The first was to allow the British companies to split up and cover 2 squares in an effort to cover more ground. The rules weren't set up that way and made these 2 figure platoons ineffective and very vulnerable. At the same time, early in the game I changed my mind on what pinned units could do and started allowing them to fire while pinned. 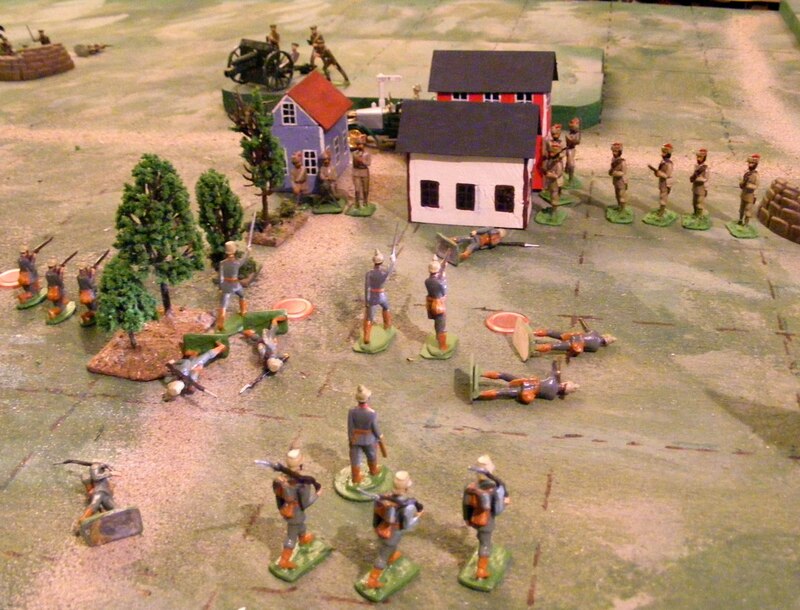 The end result, exacerbated by superb German shooting and wretched British dice, was that the Germans advanced into range, were pinned, and proceeded to shoot the entrenched Brits to pieces almost without loss themselves. I called in the French but then annulled the game and reset, this time playing the rules as scribbled on the note pad rather than with the two off the cuff changes. This is the game seen in the pictures. The plan was to pin the main objective with one battalion while taking the village with the other supported by artillery and machine guns. (same plan as the first game). It didn't go so well. The first battalion suffered heavy losses and was repulsed and the supporting artillery driven off the hill while the 2nd battalion pushed a bit too far forward and started taking losses. A request to withdraw (player morale failure) was refused as the German force was nowhere near its 50% army morale level so the attack was reorganized and pushed back in supported by dismounted cavalry, the remnants of the artillery and the MG's which had been slow to come up. This time the British company in the town was forced out by a bayonet assault and the company entrenched in the open was slowly wiped out by concentrated machine gun fire. The cost of this success though, was was heavy. On the German right, the additional companies brought up from support began to make a difference and they began to creep close enough to assault. The last Indian company had to be brought forward and used to flank the attack. This is where the 2nd German cavalry squadron was supposed to be but it had drifted over to the center and had been used to make a dash at the British guns. The remnant rallied back to the center and dismounted again. For a few turns it looked like a final push could do it but command control difficulties and heavy losses, from MG and artillery fire in particular, took their toll. Finally the flanking sepoy company went in with the bayonet and swept away one battered, pinned company and then another and the Germans hit their break point. On the British left a combination of artillery and machine gun fire, and a flanking counter attack by sepoys has destroyed the German 2nd battalion. Across the table the German 1st Battalion has taken the village but suffered tremendous casualties and with their supporting artillery and machine guns silenced, the attack is called off. Oh well at least both sides can now field small but balanced forces for France 1914. I had squashed my initial urge to repaint a squadron of Larsen's Lancers for 1914 as the Indian cavalry in France seem to have worn European style tunics rather than khurtas. However, after some reflection, I decided that since I don't intend to field 10 man cavalry regiments going forward, drab, late 19thC lancers would be useful in their own right, the minor uniform discrepancies wouldn't actually bother me, one of my goals is flexibility with restraint on shelf space, and one goal was to give the sense or feel of an army composed of figures bought off the shelf in a store long ago, it made sense to do a quick repaint of 4 figures letting me get a game in sooner and maximizing usage of existing figures. So I did. I'm still considering the MG question. One aspect has softened, The initial idea of fielding 1 per battalion for the British and units of 2 per regiment for the Germans or at least 8 didn't feel as attractive when I decided to scratchbuild rather than buy them but with 3 done I'm more sanguine that in the long term I can add as many as I need. Another aspect that I'm still studying is that the larger MG units seem to be subject to some sort of diminishing returns effect. In other words, while more MGs mean more bullets and can wipe out a formation caught in the open, and a unit of 6 mgs can cover more ground than a pair, it seems like one well sited MG can have 90% of the desired effect of halting or repelling an attack. It also appears that 1 or 2 mg from an mg unit could be attached to an infantry unit when the situation called for it so paper orgs don't always tell the whole story. Since large, separate MG formations became more common during the war it seems they did fill a purpose but one must also remember the quick appearance of light machine guns in the infantry units taking over some of the work. At this point my approach will be to field MG units on both sides in proportion but to allow them to stack with or be attached to infantry or other MG units without becoming a dense target and allowing both units to shoot unlike having 2 infantry companies joined where they are a dense target and only 1 can shoot. Ok, time to set the table. B Battery is now ready to take the field. Crescent 18pdr with 4 British crew converted from Zinnbrigade Germans by carving boots into putties and changing helmets into peaked caps. Likewise with the Brigadier snd his driver except the latter has been put into tropical kit with Wolsey pit helmet and shorts. The car is a Matchbox something or other. One crucial thing that I've been putting off is the German machine guns. After studying pictures and contemplating my available skills and materials, I decided to again let go of any thought of a proper model as it would be too fragile in the unlikely event of me finishing one. The same technique I used to carve the gun out of a bamboo skewer would work again. It was the sled mount that bothered me. I finally decided to go with a single piece of wire bent to shape. So, instead of 2 front legs joined by a reinforcing bar, there is a loop of wire. The barrel is grasped by the bend at the top and secured with glue. Another piece of wire forms the elevation screw and supports the breach while a sliver of thin wood joins the rear legs. I intended to use wood for the sides as well but I had putty on the go so used that. The German MG companies wore a jaeger like shako but I'm not clear about the mg companies that were integral to the infantry regiments. Looking through Nash's book I found mg crews in shako but also ones in the spiked helmet. So I did one of each, an infantry one and a specialist one to be attached to the cavalry and jaegers. The whole subject of MG organization in the opposing armies is an awkward one from a a non gaming POV unless doing something close to 1:1. The BEF fielded 2 per battalion or 8 in all for a 4 battalion brigade. The Germans fielded a 6 mg company for each 3 battalion regiment. After much thought I decided to chant "toy soldier war Game" and field generic MG units for both sides. The German MG's and crews mid process.